If you are camping, why not lock your tent? It’s a great precaution and super easy if you have a combination lock that your campmates know the combination to. You can also lock main zippers of your backpack shut if you will be wearing it all day ad need to carry some important stuff around! Open bags are a no-no at festivals. Super dense crowds are unfortunately a pick-pocket’s playground, even if stealing is against any and all good festival vibes. A great festival hack is to make sure your bags all have zips, and keep your most valuable items (money, phone, cards) in the innermost pocket of your bag. Fanny packs (bum bags) are the best for this, especially ones with inner or back zip pockets. I always keep my hand on my bag just in case – but it’s best to keep your things safe in zippers no matter what. Don’t keep them in your pocket! This makes is to easy to fall out or get stolen, especially while dancing, in dense crowds, or after a few drinks. This is another reason why I love fanny packs – they can be locked and safe right at your waist! Before going off into the venue for the day, maybe pick a meeting point at which to meet your friends if you get separated. Don’t pick something super big like the main stage, try something smaller. For example: the front right table outside the burger stand, the middle tree between the merchandise tent and the beer garden, or the fifth pole from the front left side of a stage. Don’t pick meeting points too close to any tent or stage, or in areas that are very likely to be populated; pick something away from the rush. Make sure it’s foolproof and specific, and that you would not be able to miss each other! Use the same meeting point for the whole weekend, and use it to meet up after different shows too. It’s one of the best festival hacks and you get to avoid having to use spotty or nonexistent phone service or excessive stress to find your crew. Big groups are hard to deal with! If one half wants to see one artist, and the other wants something else, no sweat! Just pick a nice meeting point in the middle to meet at after each show. Make sure you set a specific time and place – see the tips above! When you are groovin’ for days at a time to the world’s best sound systems, and you do it multiple times a year, it actually really does take a toll on your ears! I denied this for a while, but nowadays sometimes I legitimately feel like I have gone a little bit deaf from all the festivals and shows I go to. So now I am smarter and try to protect my hearing, because, well, it’s kinda something I would like to keep for a long time. I just got these high fidelity earplugs that preserve the sound but protect your hearing, and they’re also clear and not too visible! This one should be a no-brainer, but some people still need reminding of one of the most important festival tips! The number one thing to make sure of during a festival is to drink lots of water. Dancing, drinking, and lots of moving around creates an extra need to stay hydrated. So, bring bottles to fill inside the venue (grab some of those collapsible bottles sold all over the place now, or just scrunch up a normal bottle) and keep refilling the same one all day. If you’re at one of those festivals that doesn’t allow you to bring containers in or one that only sells uncapped water bottles, try and hide an empty bottle in your bag (wrap it in hats and shirts or something) or bring some extra bottle caps in so you can reuse bottles you buy. It’s not worth waiting in line so many times, and all festivals should have a place to refill water bottles. Make sure to always have some food throughout the day at a festival, even if it means just a granola bar or a tangerine (tangerines are the best snacks, seriously)! You can bring some in with you, or grab some from food stalls. Don’t forget! It’s hard to know what to pack for a music festival, especially if it’s overseas. When you have to condense everything into a checked (or carry-on!) luggage, your priorities change quite a lot. Lucky I have written a massive, in-depth, comprehensive, all-you-need-to-know checklist/guide to packing for festivals abroad, or stocking up for them if you’re already traveling. Read it right here or click the image below – it opens in a new tab! These are truly my very best festival hacks for festival travelers! All of these festival must haves and important items are listed and linked to in my festival checklist above – make sure to check it out also! I CANNOT stress this one enough. Those silly little hand fans that your grandma gave you as a souvenir or that you bought off someone on the streets of Europe for 2 euro… those fans are single handedly the best accessory you can have for hot summer festivals. When you’re in the middle of a hot, sweaty crowd or getting heat stroke walking around in the sun, these little hand fans do absolute wonders to keep you and your friends cool. GET ONE. I have been the most popular human in entire crowds before just by fanning strangers; someone even gave me a bracelet once because being fanned made them so happy. Fan yourself, fan your friends, fan strangers, and spread happiness. 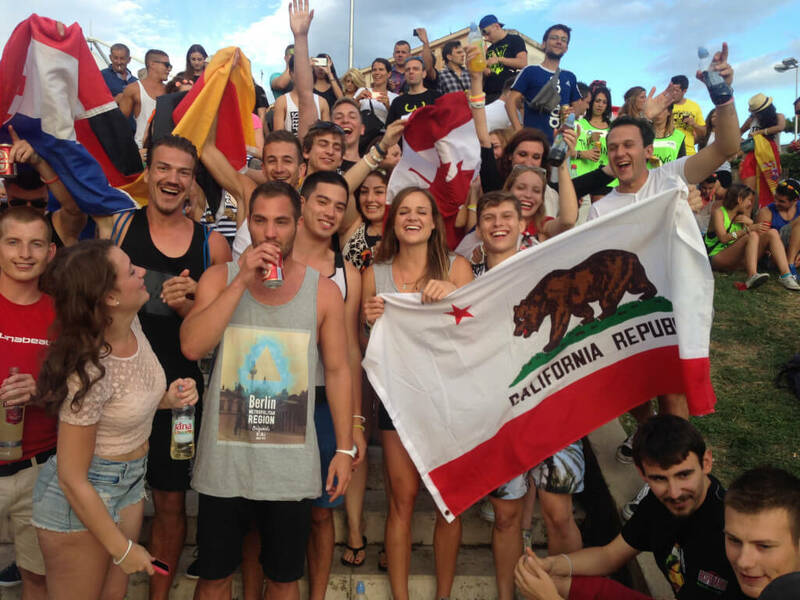 For more international festivals, it’s always fun to bring your flag! I have seen so many beautiful new friendships form over conversations brought about by holding a certain flag, or people from the same country at a foreign festival meeting up. I always bring my California flag to big festivals – and am always proud to represent and talk to people about my beautiful home state! (Note that I don’t bring the USA flag though… lol). Baby wipes are useful for infinite different purposes at festivals. They are great to clean off dirt or use if the porta-potties run out of toilet paper, which is all too often. Most camping sites don’t have chargers, and having phones die during festival is so frustrating when you want to meet up with friends or take loads of photos! This is why I always bring an extra charger box with me, and charge it up before the festival begins. Depending on how much you want to spend, certain external chargers can hold multiple full charges in them. This one right here holds four, and in my festival checklist post I list all different shapes and sizes of external charging boxes. Very clutch! Being extra thrifty with this camping utopia! Read my Joshua Tree Music Festival Review + Guide Here! This massively differs from festival to festival, but generally you want a camping spot that is not too close, but not too far from the venue. You don’t want to walk miles to get in, and you also don’t want to be so close you have people constantly wandering (stumbling) through your campground. So – get a spot in the middle! Somewhere easy to find and close to camping amenities that the festival may have (also close enough to toilets… but not so close you can smell them. ew). Make sure you get there early so you can have your pick of camping spots and be able to spread out far enough to create a nice camping area. Camping may be roughing it, especially if it’s hot. But if you do it right, you can live large. One of my best festival tips is to get your group together (as big a group as you can!) and spread out over a good sized area. Zip ties – for literally everything, trust me. Inflatable Couches – for extra comfort and lounging capabilities – even a whole L Couch! Coolers – especially the rolling ones! If you have a car you can bring more, of course, all dependent on the festival! 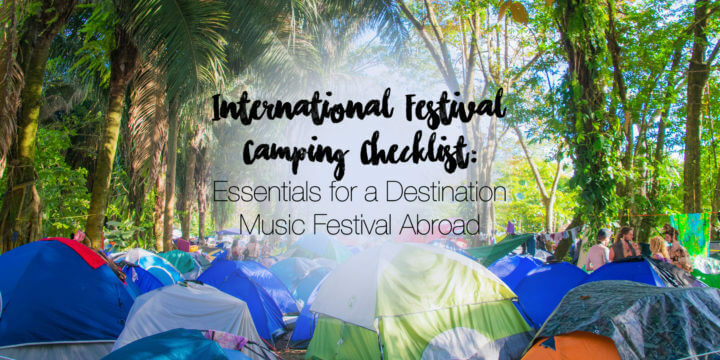 Read more about why camping makes for the best festival experience and if you’re going to an international festival, check my destination festival packing list. Circle all the tents around one area, and put some EZ ups over them to create an extra layer of sun protection so you don’t wake up sweating as soon as the sun rises. If you don’t have enough EZ-up’s, try to Macguyver some tarps over your tents and chill space with zip ties to create as much shade as possible for a hot festival. Having two layers of cover helps disperse the heat! Make sure you bring a good amount of drinks and snacks to have at your campsite. Peanut butter and jelly or avocado and hot sauce with bread are great ideas for a quick sandwich. I also love bringing chips and dip (like the canned cheese dips or bean dips that don’t need refrigeration), trail mix, or granola bars. You can take this farther too by bringing a little grill and cooking, or making cereal or muesli in the mornings if you can get ice to keep supplies cool. There are tons of possibilities! In the middle of or next to your tents, make a little living area. This is where you put your chairs, coolers/drinks, tables if you have them, and mats to stand on. Circle the chairs up around a table, put all your supplies and food in one area, and create a nice little space to hang out. If you’re especially dedicated, you can even decorate it with solar-powered lights, pillows, colorful sarongs! 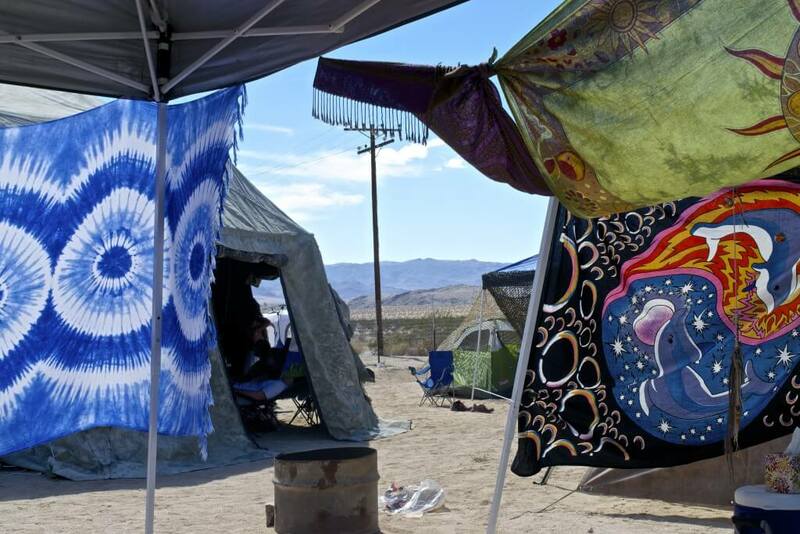 Get your tarps, tapestries, and extra sheets and find any way you can to stretch them across your campsite. Use safety pins to attach tapestries to the sides of EZ-up’s, and zip tie tarps from EZ-up’s to tents to trees to anything. Create as much shade and privacy as you can/want by stringing tarps and tapestries over the top of your little living area. String, safety pins, and zip ties are the best items to use for this. You can get thrifty with this too! I don’t know about you, but I absolutely love creating an amazing camping space to live in for the 3-4+ days of a festival. Having a good living space is one of the best camping music festival tips ever. Flags on flags on flags at Ultra Europe in Croatia! Read my Ultra Europe Review+ Guide Here. If you’re a traveler as well as a festival lover like me, you need to know about an amazing new company that is revolutionizing the market called Beats Travel. 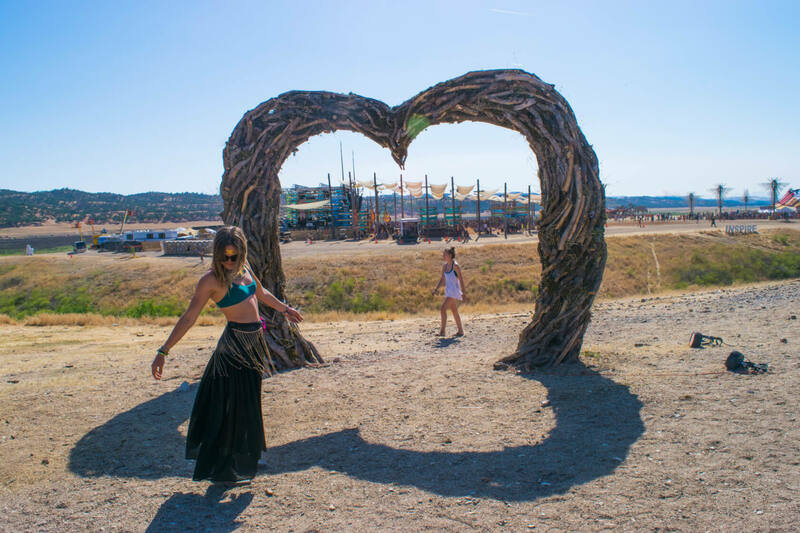 Beats travel has filled a hole in the travel industry that music lovers have been needing; they organize culture-centered tours around amazing off-the-beaten-path music festivals. They have started in the Balkans, and are expanding to India and beyond! Check them out – and use my promo code ‘kimmiebeats’ if you want to sign up! I also run a Facebook group for people like us who travel for music! Jump on Facebook and join Music Festival Travellers, a community 0f like-minded travelers who explore the world in search of the best festies, friends, music, vibes, art, festival hacks, and fun. My goal is for the group to be a supportive community of people to discuss and ask/give advice on any and all festivals through the world and find friends and a festival crew for any solo festival travellers out there (with “travellers’ spelled the Euro/Aussie/British way because America spells things weird :P)! Read my post here about traveling to European music festivals to read my best festival hacks specifically for those of us who travel to Europe for its more-than-spectacular festival season! Included are some of the resources above plus more companies to travel with! At Lightning in a Bottle Festival in California. Read my LIB Review + Guide Here! Share your water with those in need, share your space with others, share your beer with campmates, share your soap with the people behind you at the shower who forgot theirs, and share moments with friends and strangers alike. It doesn’t take a lot to smile, so spread that happiness everywhere you possibly can. Because… why not? Festivals are an open space for people to enjoy and express themselves, and you can encourage this by spreading a simple smile. Respect others and their space. Give people their room to dance without pushing and shoving – you can have just as good a time at the front gate as the back hill. Help others out – whether it’s helping hold people up attempting a triple shoulder stand, or helping someone carry their food to a table. Everything counts, and will encourage others to pay it forward! People greatly underestimate the power of a simple ‘hello.’ People are already on such a great open mindset at festivals, which makes it amazingly easy and fun to meet new people. Don’t be shy – talk to people, learn something new, and maybe even make some new friends. 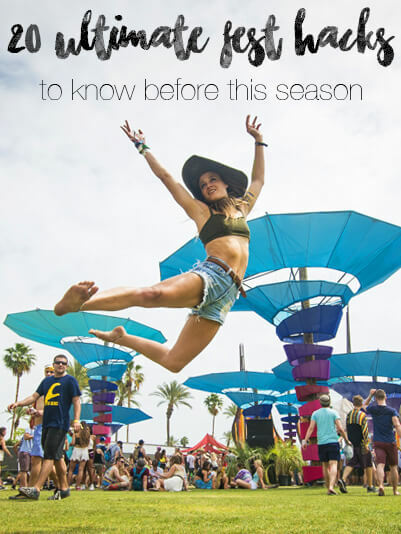 Share these festival tips with anyone who might be hoping to pimp out their experience this season! What are some of your festival must haves?